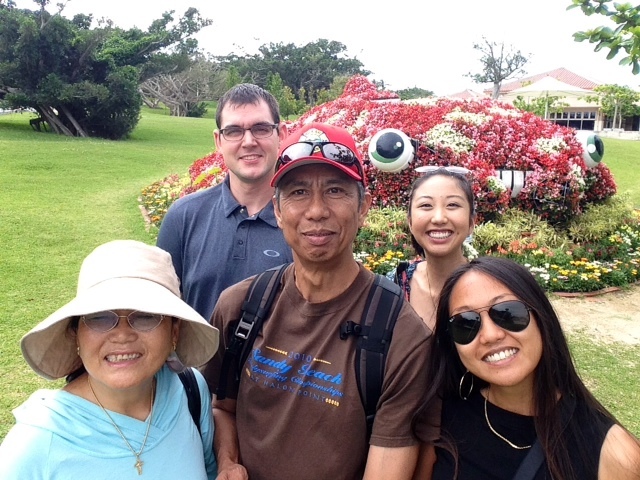 It was a pretty rainy day but we went to Okinawa World, nestled in the middle of farm lands! 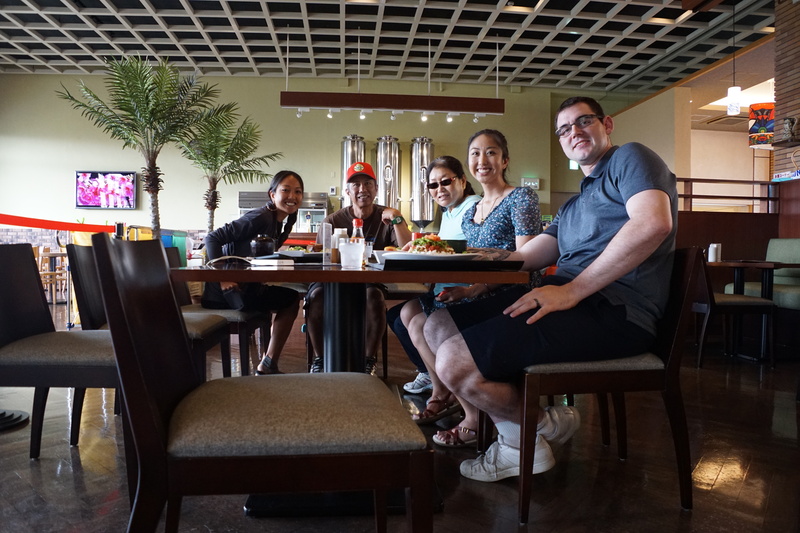 It was like… Polynesian Culture Center (but not? lol). It was a huge tourist attraction but it was fun! 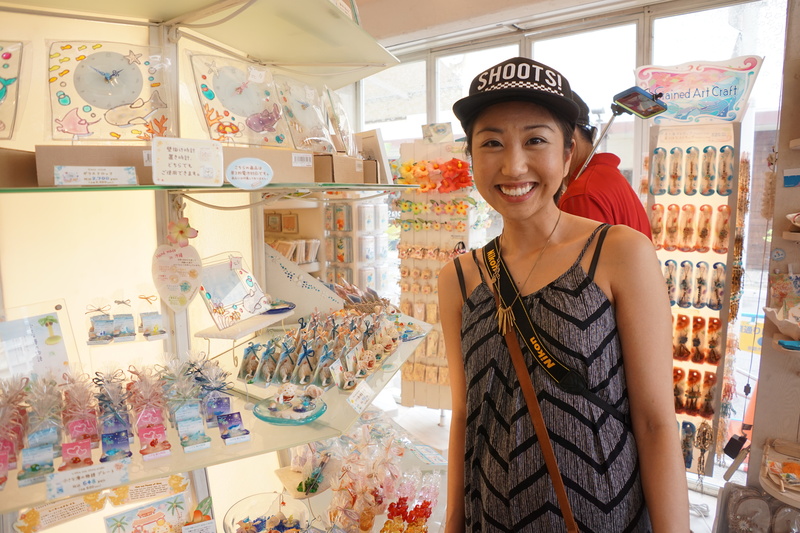 Cathy went crazy with souvenir buying again but this time she got a coupon and a free bag! 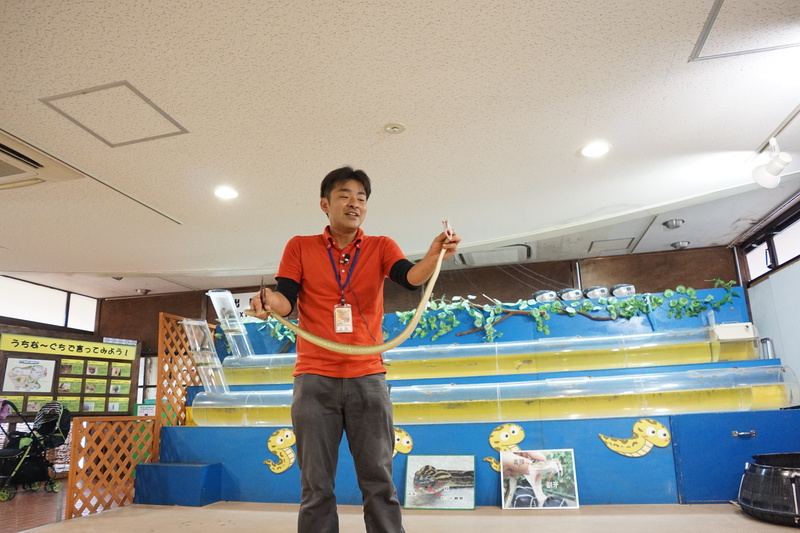 I really appreciated the large scale maps they had, especially of the distribution of snakes found throughout the Ryukyu Islands. It was very interesting and I learned a lot from the exhibit! I didn’t know the there were so many different types of snakes found here. 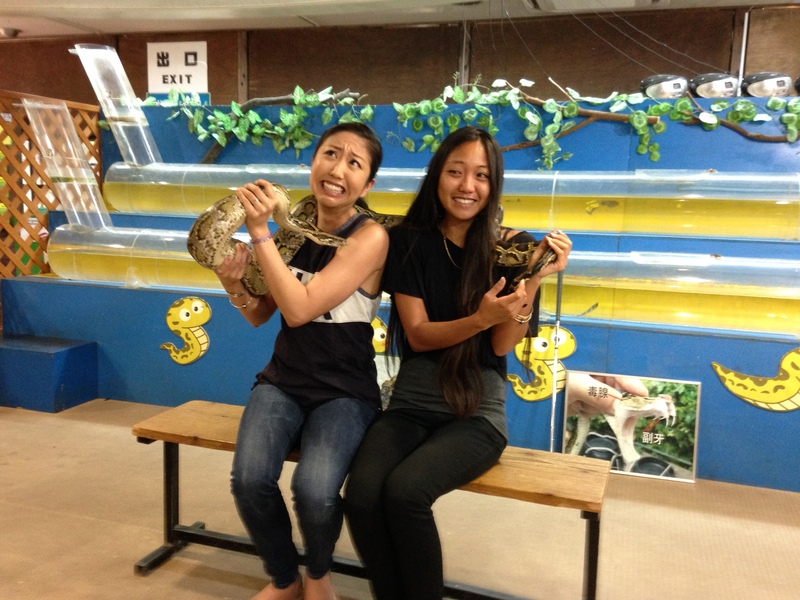 The most common snake found in Okinawa is habu (ha-boo) and it’s poisonous! I hope I never encounter one in its environment. 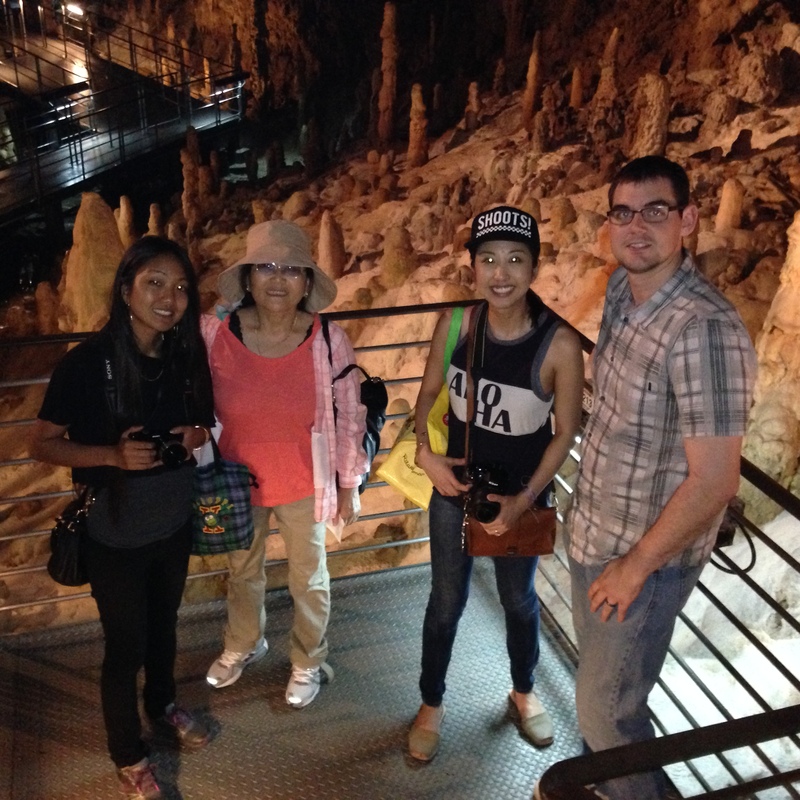 Towards the end of our time there, we walked through the huge Gyokusendo Stalactite Cave. 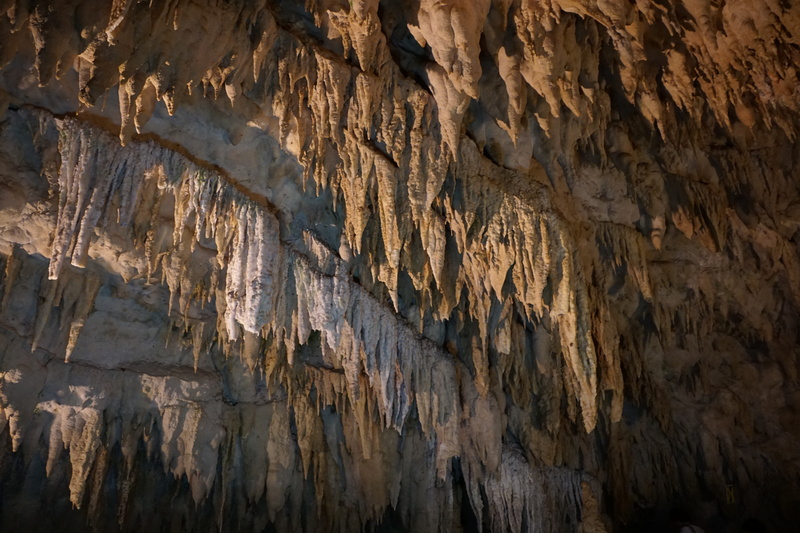 This cave was massive and it was so interesting to walk through it, granted there was a very nice path to walk on, it was pretty wild! 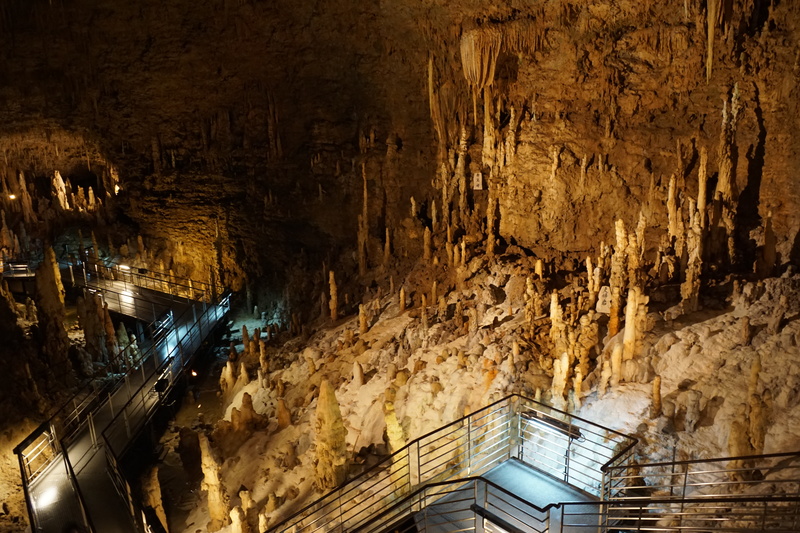 It was beautiful and unique and I’m pretty sure that was my first time in a stalactite cave ever. Please enjoy the pictures! Me and dad! Can you see the snakes in the background??! Hint: look at statue O__O! How to keep habu away! 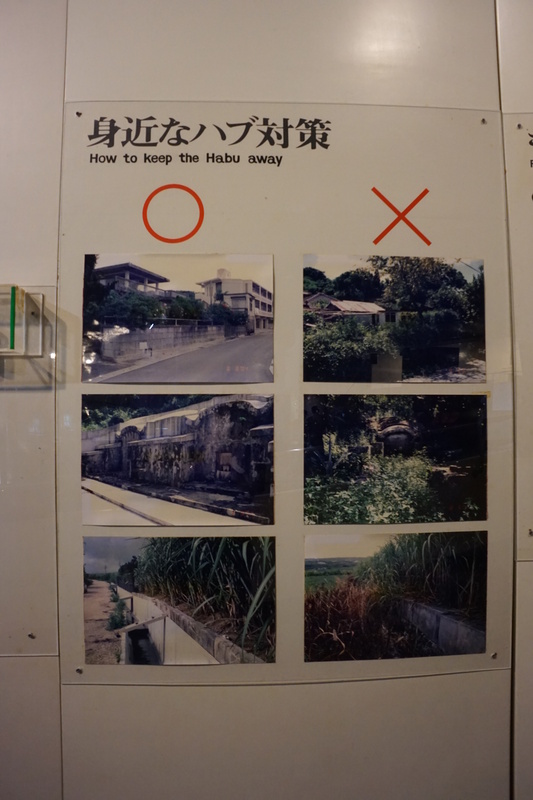 Okinawan Cultural Museum. 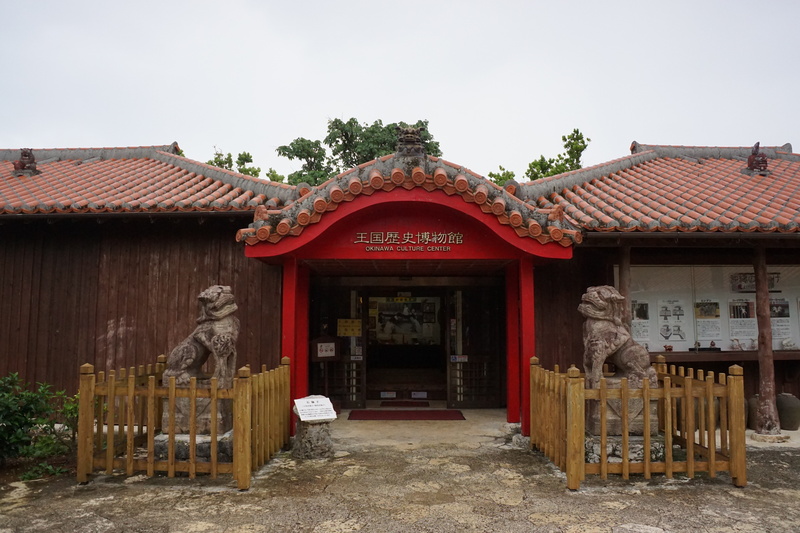 They had a lot of Shisa (Ryukyu Lion/Dog) from all over Asia. It was really neat to see how similar the Shisa is in different parts of Asia. It was huge, we were walking for like an hour to the other end! It was seriously a very huge cave haha! I have some really nice frames from here and I will make a video soon! I have to get ready to leave the house! Happy Memorial Day Weekend guys! 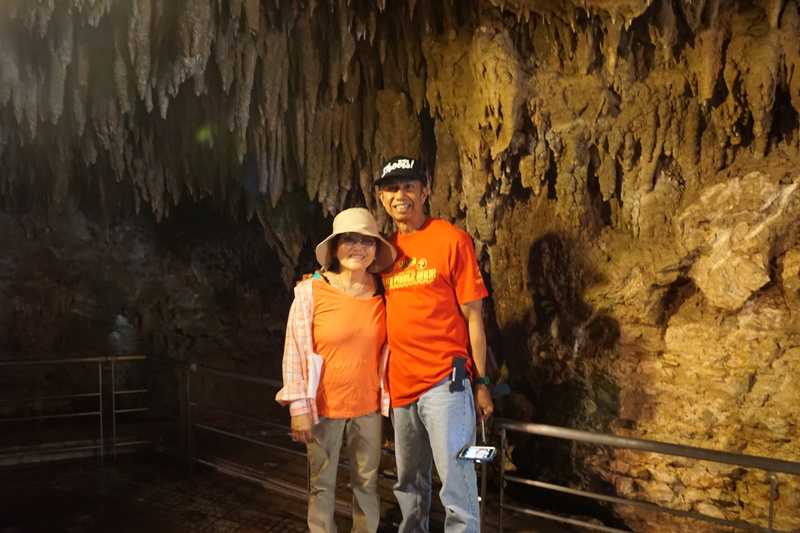 This entry was posted in 2015 and tagged gyokusendo cave, habu, habu show, habu snakes, okinawa, okinawa world, travel. 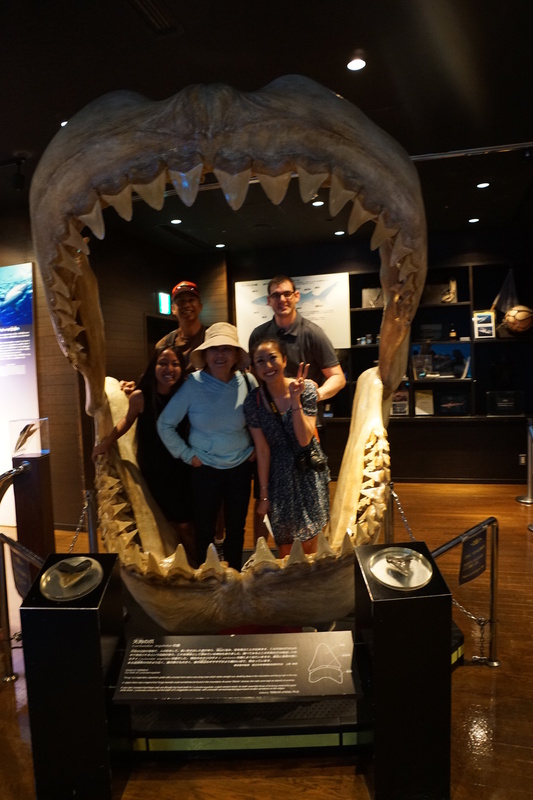 My third day in Okinawa and we went to Churaumi Aquarium in Motubu and Orion Beer Factory in Nago! We also had the chance to visit American Village in Chatan, it is literally right down the street from where I’m staying. I have been looking forward to visiting the aquarium for a long time because I have never seen a whale shark in person before! 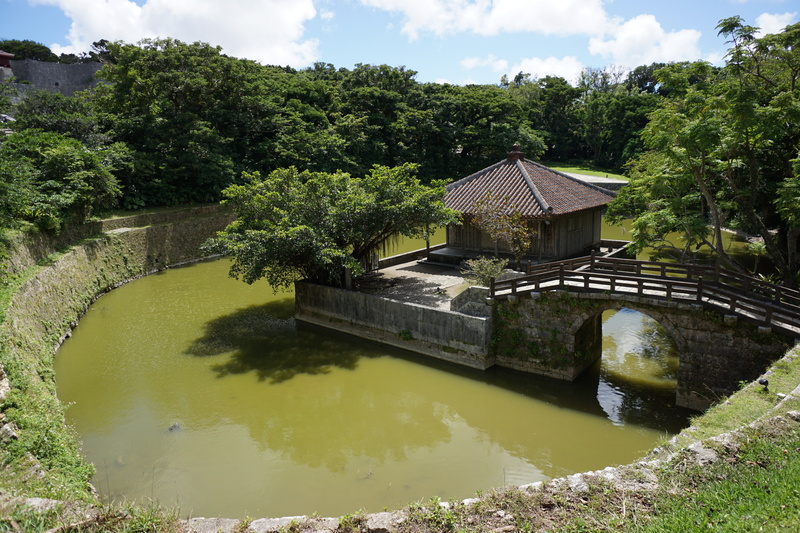 I am staying in Ginowan, which is in the southern half of Okinawa Island ( I WILL MAKE A MAP SOON! ) 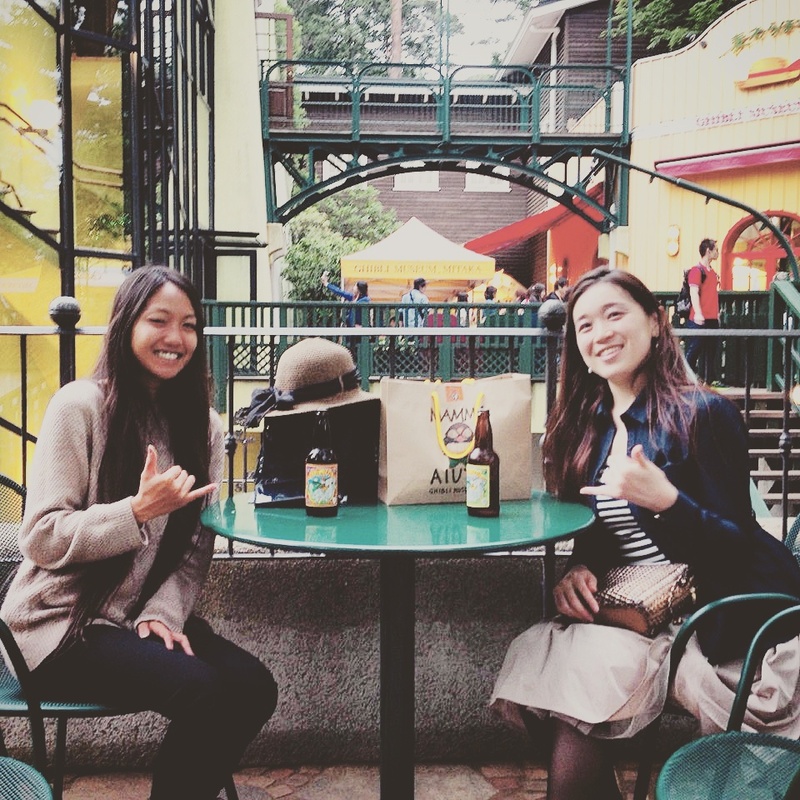 and we had to drive to the northern half to Motubu and Nago to see the aquarium and beer factory! It was really nice to drive along the coast. This island is like the Japanese version of Hawaii! The aquarium was so beautiful! It was the biggest aquarium I’ve ever visited and it was magical! There was a lot of tourists (many from China) and it was crowded! I got to see the many different fishes that are found in this part of the world. We have a lot of the same species but they come in different colors here! Please enjoy my photos below! 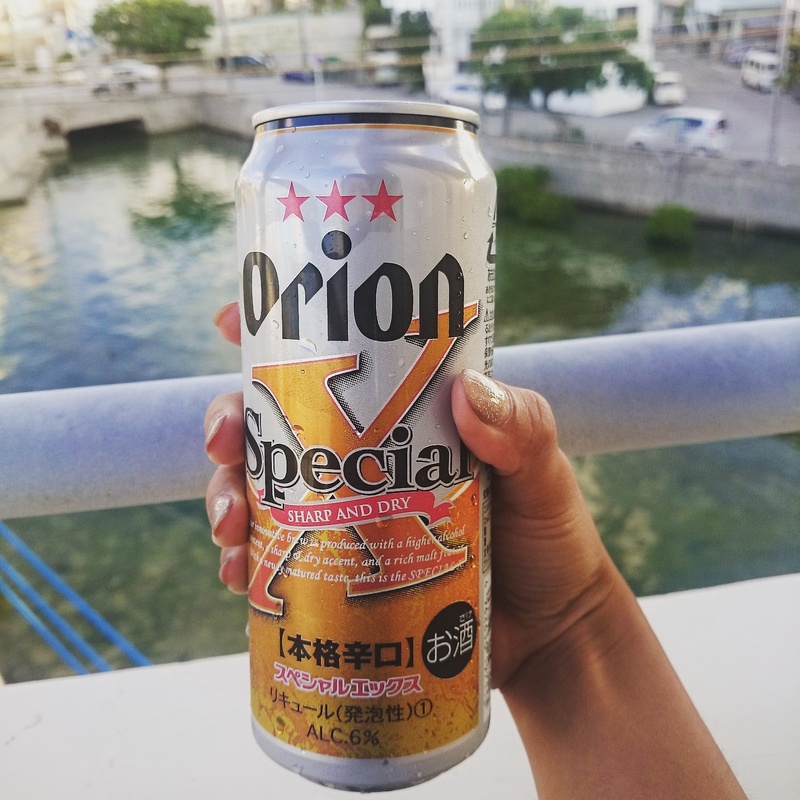 My favorite beer is Orion and we had the chance to visit the Orion Beer Factory. They offer a free tour and beer tasting (you get two free beers!) 🙂 The tour is entirely in Japanese but it was really neat to see how they operate there. We drove back to Ginowan using the Express Way. It’s the equivalent to our freeway but you have to pay a toll fee. It was very fast and efficient. I didn’t take any pictures but we were driving through the wild part of Okinawa and there were many hills and mountains. It reminded me of driving on the Pali Highway because of the nature but it was not curvy. We went to American Village and it was really neat. It was the first time we walked along the ocean where we saw people of all ages enjoying this area. I didn’t take any photos (sorry!) but I witnessed local kids jumping into the ocean! I wanted to but maybe next time! Please enjoy the quick video I made of Churaumi Aquarium (43 seconds). I didn’t shoot it in movie mode, it is entirely in individual picture frames (11 fps!). 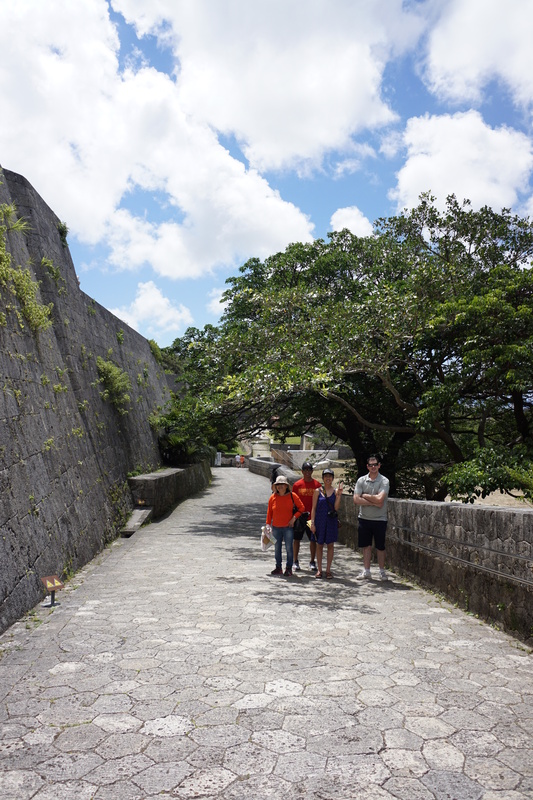 I am so in love with Okinawa! 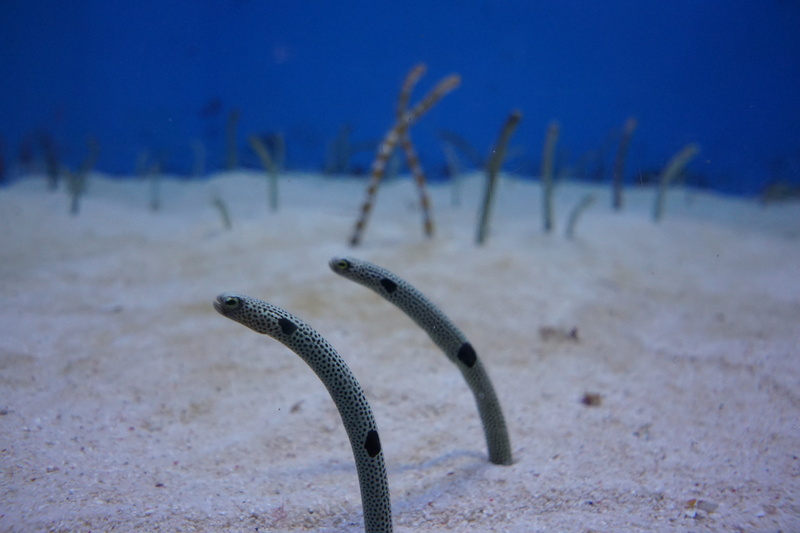 Churaumi Aquarium May 2015 from Cencia B. on Vimeo. 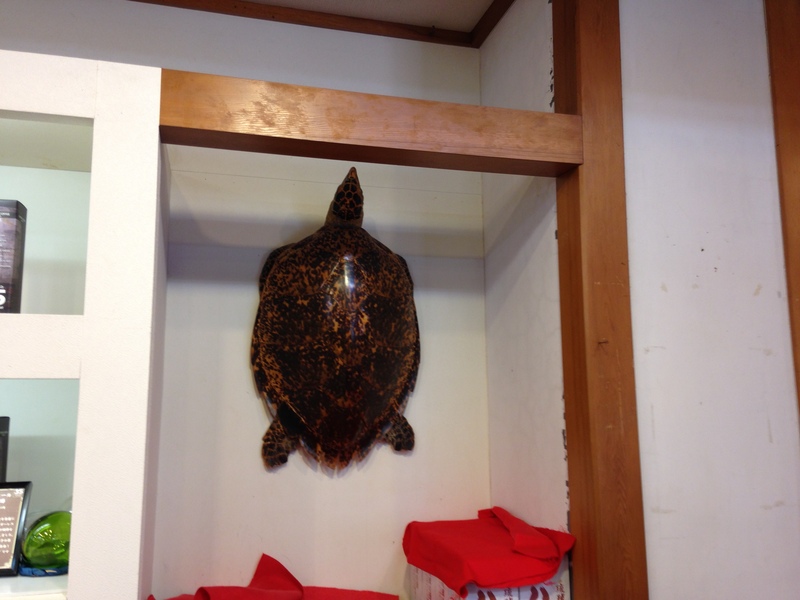 WE ARRIVED TO CHURAUMI AQUARIUM! 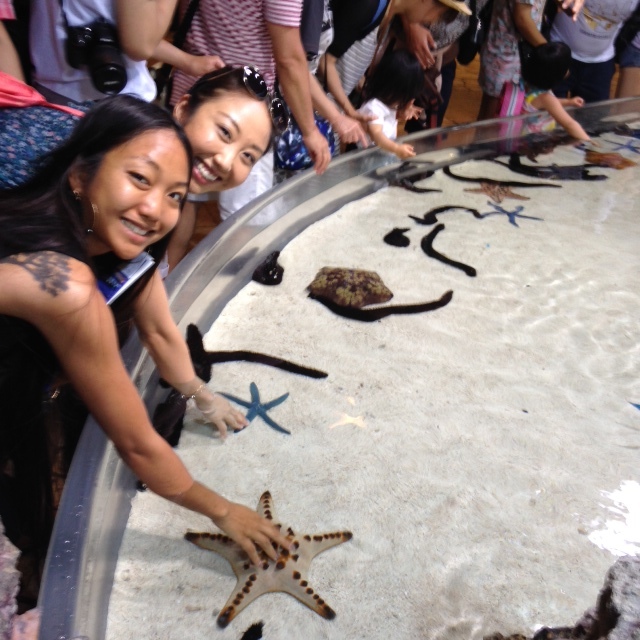 Touching some starfishes! They even provided an area to wash your hands after that was equipped with many sinks and hand dryers! 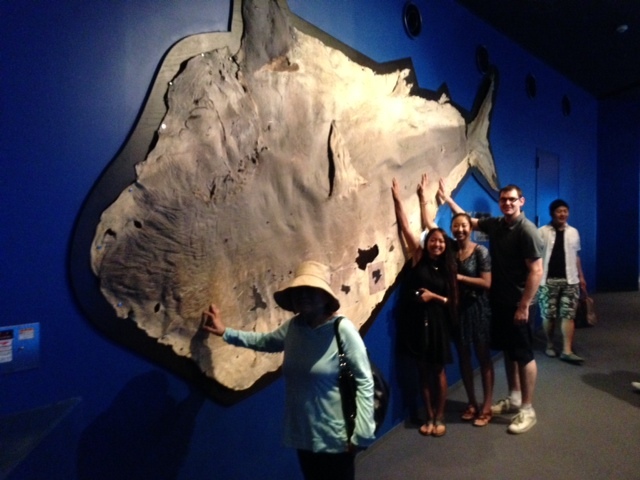 The skin of a very large Great White Shark that they caught in Okinawa. Shark skin feels like sand paper! LOOK HOW DIFFERENT THE UHU IS! I was very surprised! The uhu is very beautiful here. They had a lot of different colors but this one was the most beautiful to me! 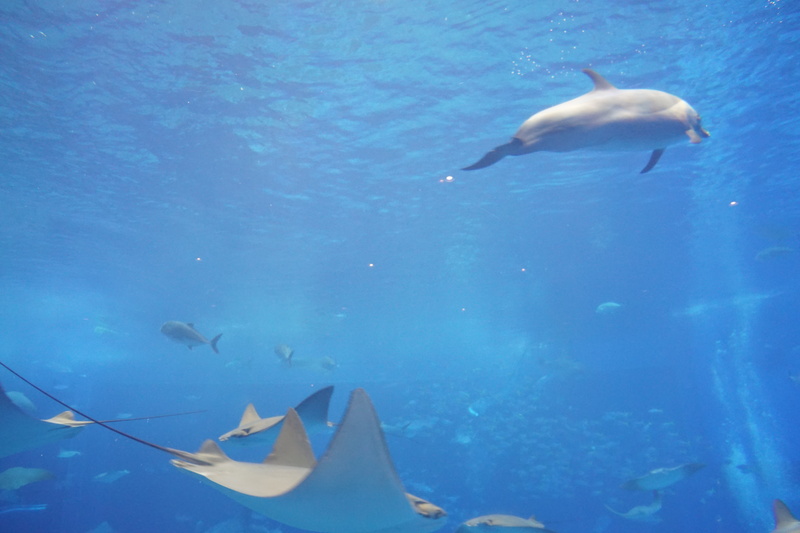 They had a dolphin in the biggest tank (only picture I had, kind of blurry sorry!). I enjoyed watching the animals in here. Very huge tank full of sharks, rays, and fishes! Family Picture! This was the shark/ray information section. I got to rest a little bit and watch a video about one of the Manta Rays giving birth to a baby. It was very cool to watch even though I couldn’t understand the narration. 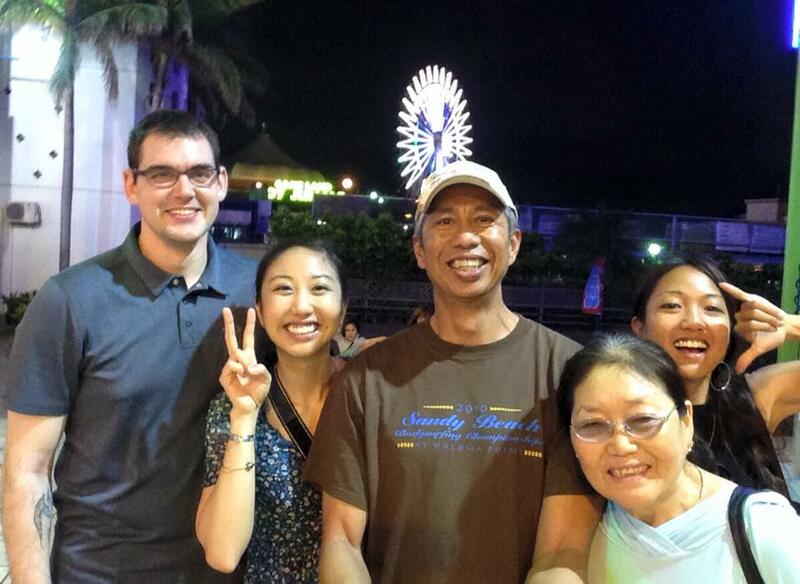 American Village in Chatan. The Blue Seal in the background is Okinawa’s version of Baskin Robbin’s. It’s really good, they have a sweet potato flavor. American Village at night. I want to ride that huge ferris wheel one day. My dad says its a very long ride so maybe next time! I’ll try to make more videos for everyone to see! 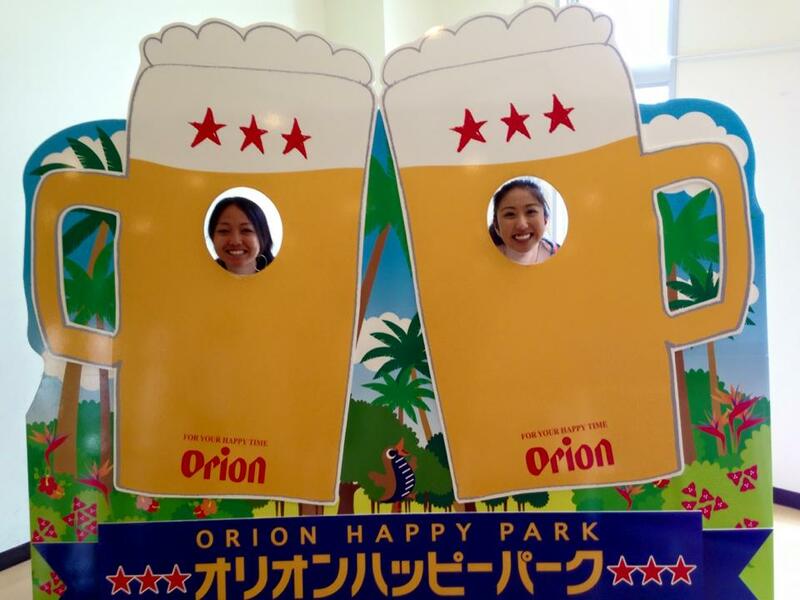 I have a few good frames of Orion Beer Factory! Right now, I have to get ready because my dad is going to bring us to his fire station to meet everyone. He always tells all the secretaries and his firefighters about us so he wants to introduce us before Cathy’s husband leaves Okinawa. Bye guys!! I miss and love you all!! 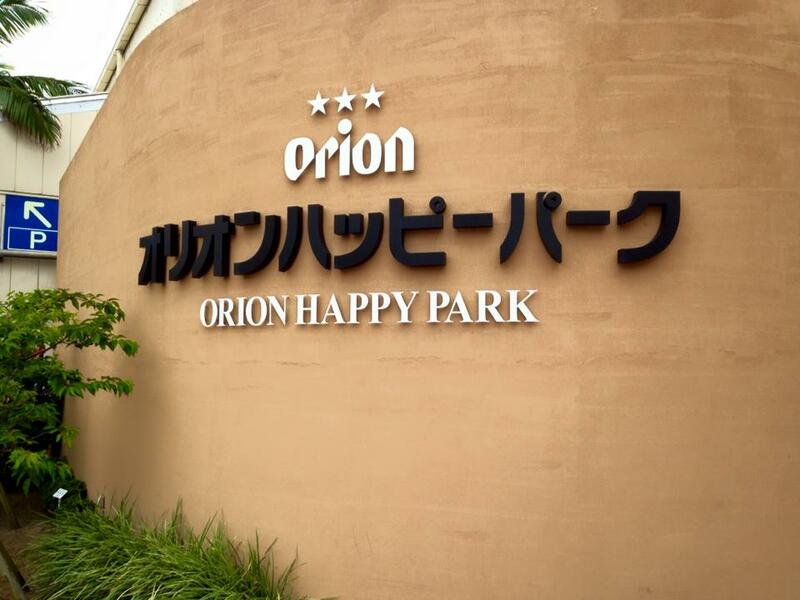 This entry was posted in 2015 and tagged Churaumi Aquarium, motubu, Nago, okinawa, Orion, Orion Beer Factory, travel. 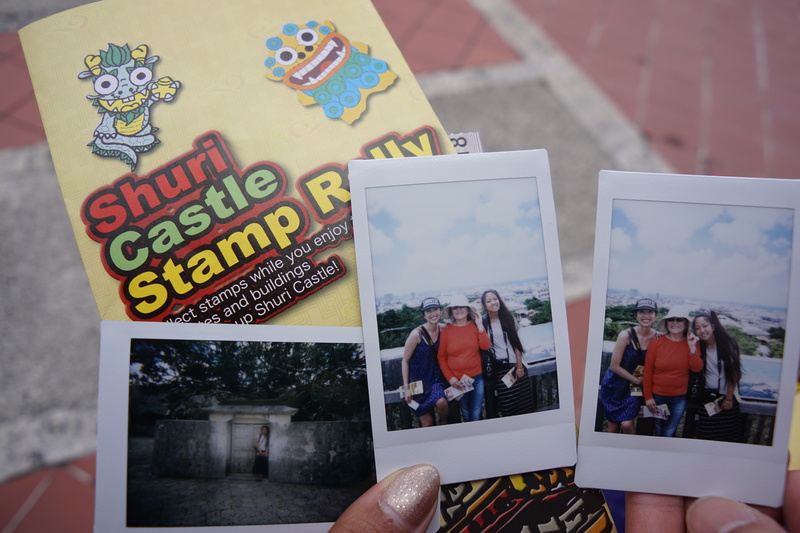 My second day in Okinawa and we went to Shuri Castle! It was a real adventure getting there because the streets are so narrow and my parents haven’t been there either! Drivers in Okinawa also do this funny thing where they park their cars right on the road and put their hazards on. I’ll try to take a picture of it! It’s really amusing! I got an International License and I am not really looking forward to driving here because they drive on the left side LOL. I’m a good driver, right?!! 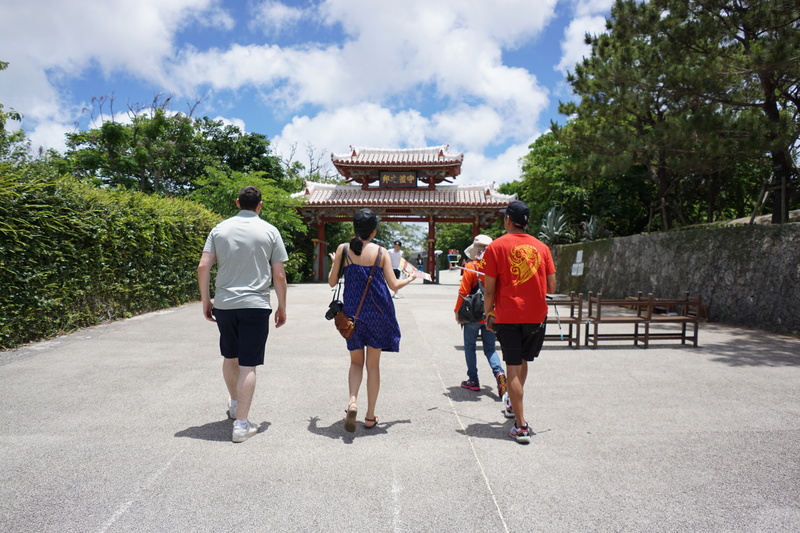 Shuri Castle or Shuri-jo is a reconstructed castle (almost entirely destroyed during WWII) and it was truly a very special experience to visit there. 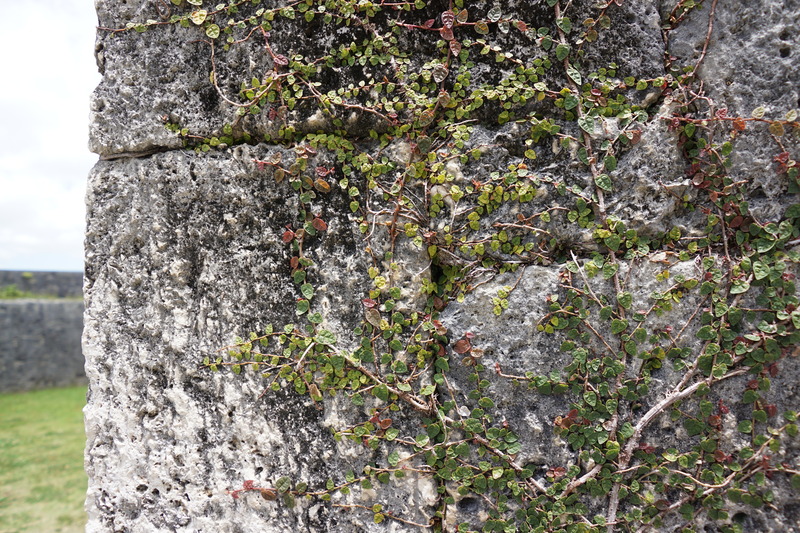 In my opinion after reading a few academic articles on gusukus, there are smaller similar wall structures that are found in villages throughout the Ryukyus that indicate that they were sacred sites based on the geography of the area. (Sorry it’s the human geographer in me!). I feel that these places are equivalents to the Hawaiian heiaus. Shuri-jo reminded me of Puu o Mahuka Heiau in Pupukea because of the view of the ocean and the location on top of the mountain. Instant film is instant fun! 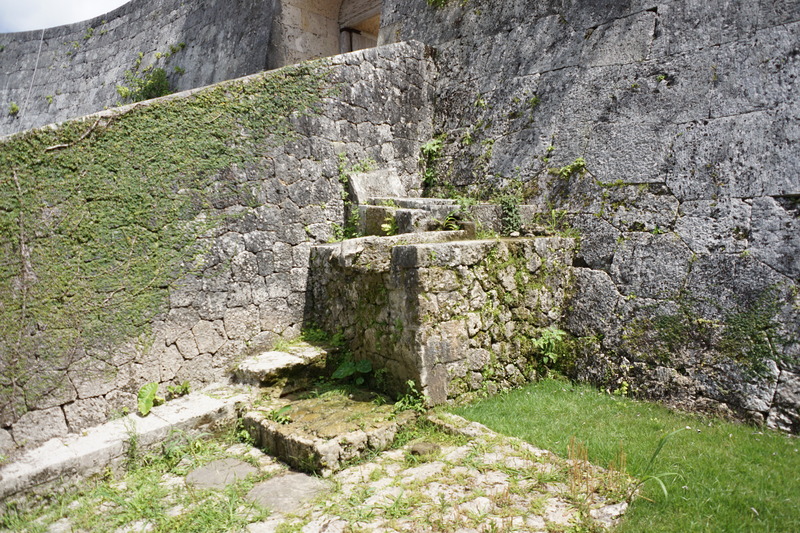 I loved the many water features found throughout this huge palace. “The Royal Smoke House” hahaha. Many koi, ducks, and turtles in this pond. Example of stairs towards the end of our time there. This park was beautiful (Shuri-jo is so big that it has its own park inside lol) and next time I want to walk around the canal and feed the ducks! 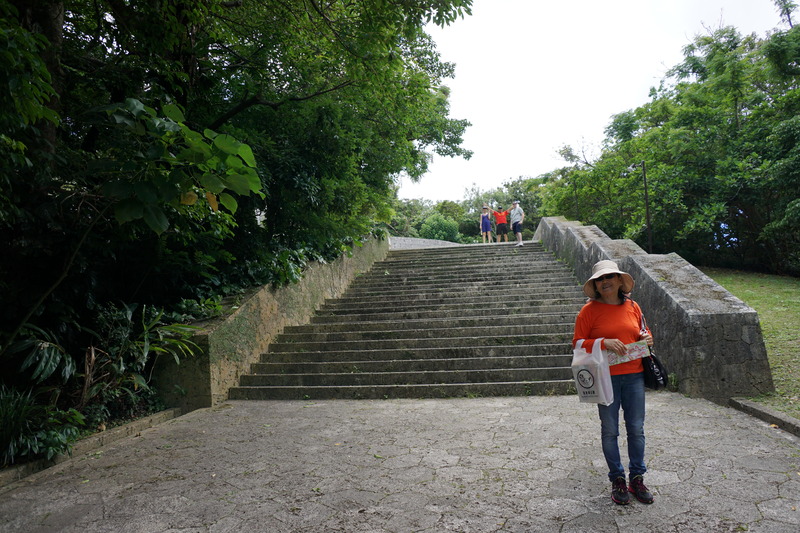 This is also the site where there were entrances to the underground that the Japanese Imperialist Army made/used during WWII. MY FAVORITE BEER! 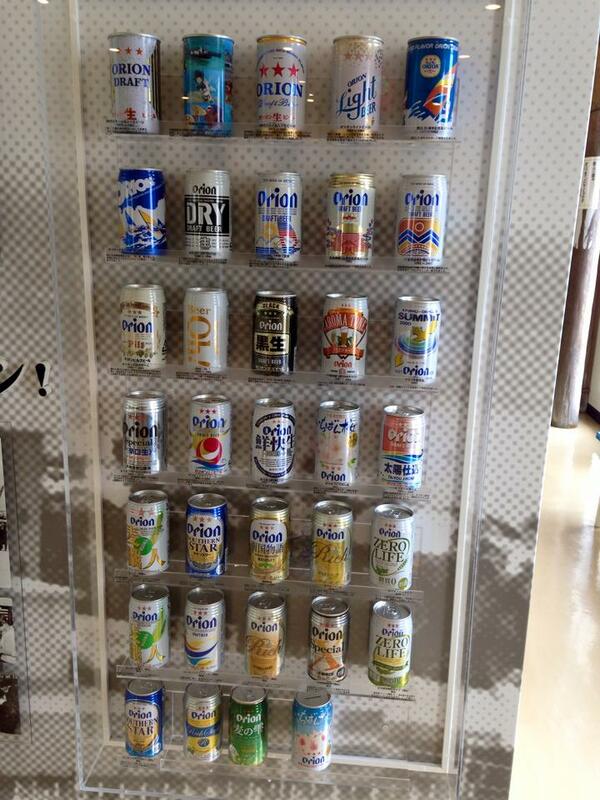 The Oji-san at Lawson’s pointed to my beer and said it was oishi. He was right! It’s exactly 7:00am here. There’s a loud speaker on many corners and they play a cute tune to indicate time. I think they do it at 7:00am, 12:00pm, 5:00pm, and 7:00pm? I will try and record it because it’s a neat idea! Today was the first time it was actually cool weather. All day yesterday was pouring rain and it was extremely muggy. I’m going to go drink coffee now and hangout on the balcony! I am so grateful that I don’t have to worry about anything during this time here. I contemplate how busy my life was just a month ago and I’m thankful that I survived (I literally survived guys! LOL). 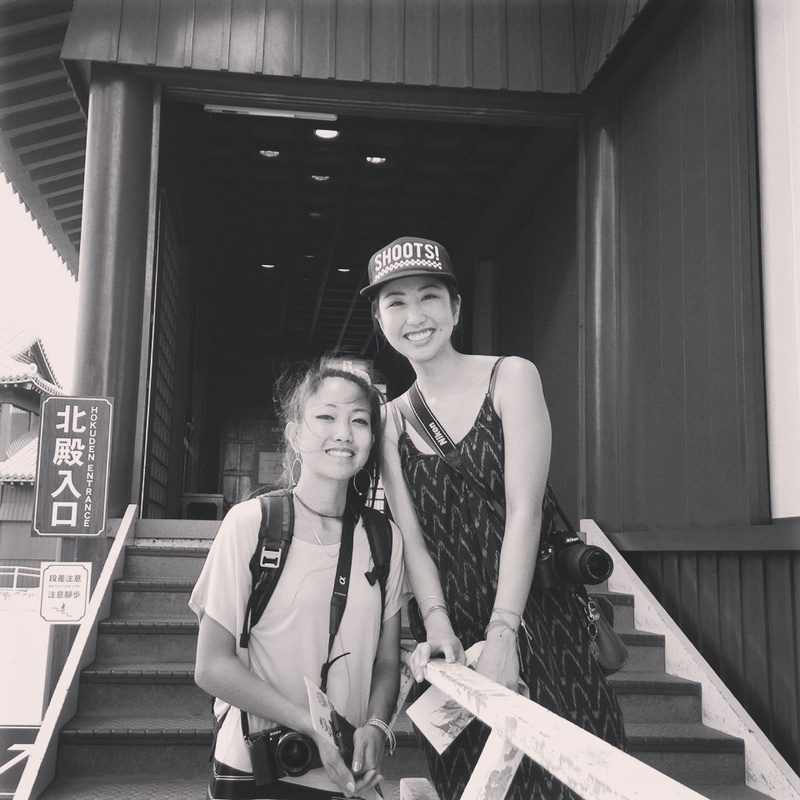 This entry was posted in 2015 and tagged okinawa, Orion, shuricastle, shurijo, travel. My flight landed almost an hour after the scheduled time because the visibility was bad due to the low clouds. Our plane had to circle Okinawa twice! 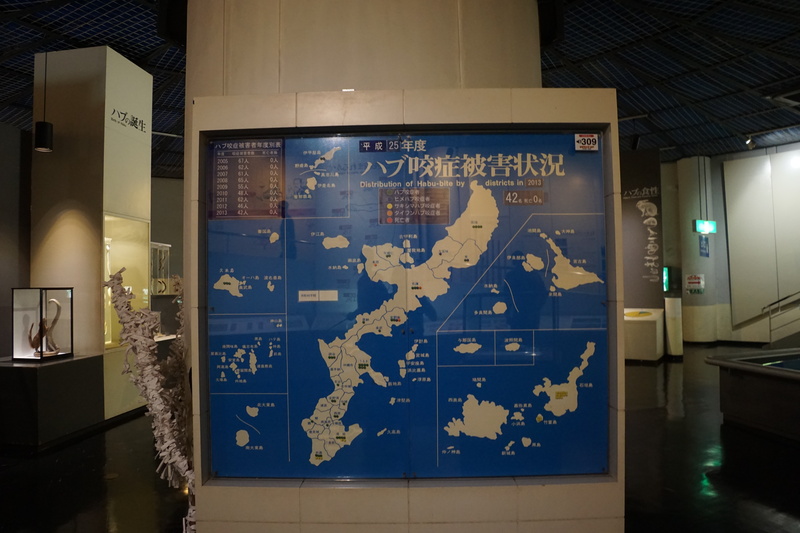 But it was a treat to see the outer islands that surround Okinawa island. When we finally landed, my parents were already on their way to pick me up! I felt pure elation when I saw them drive up! 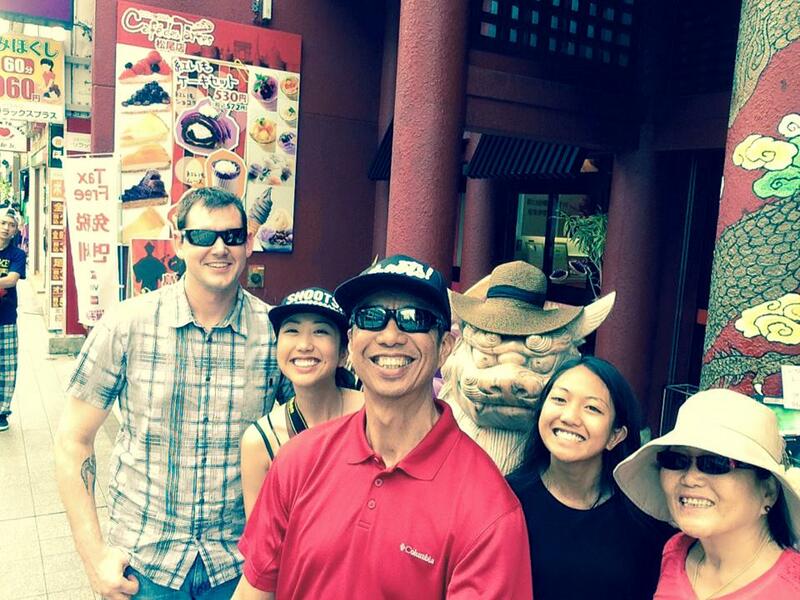 Right after being picked up from the airport, we went straight to Kokusai Street! This area is the equivalent of Waikiki and it was crowded with many tourists. 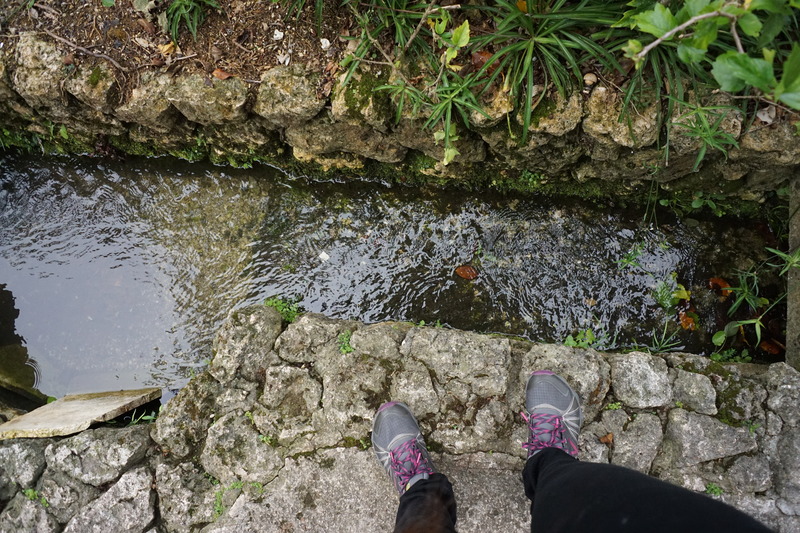 The weather in Okinawa is sub-tropical and very humid. 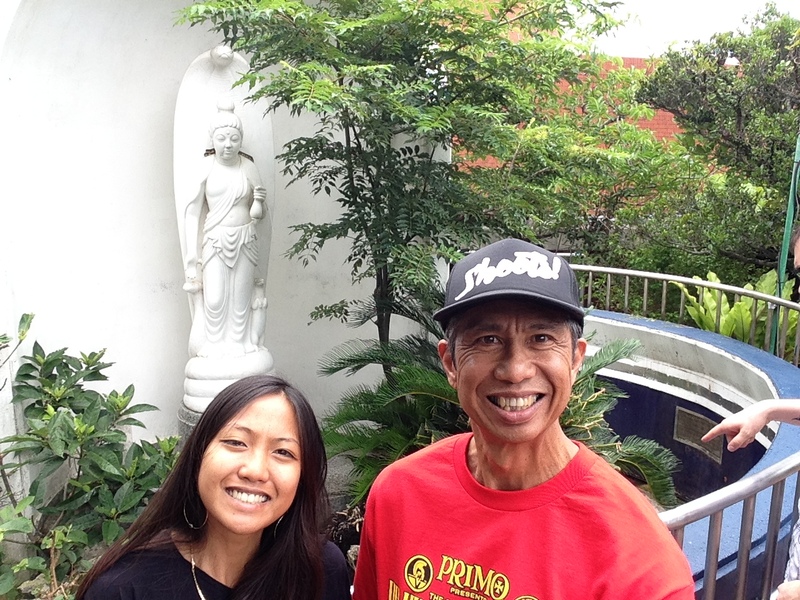 It brought back memories of being in Southeast Asia. I usually do not perspire, even while hiking in midday, but it is a different story here. It’s like walking in a thick invisible wall of muggy hot air. We have it good in Hawaii with the tradewinds 🙂 !!! 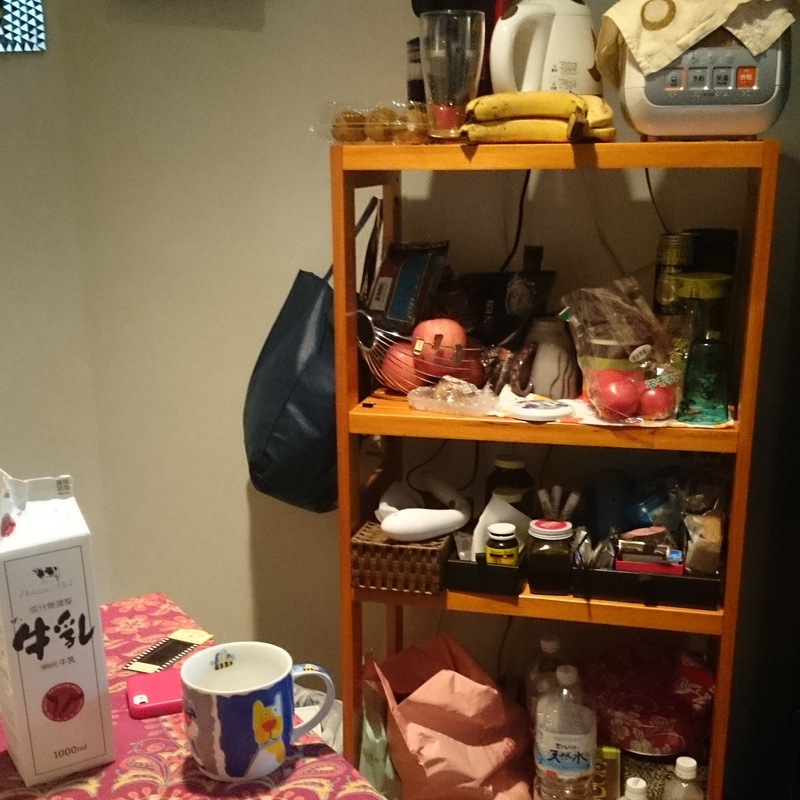 After walking Kokusai Street, we went to my parents’ home. They live in a beautiful apartment that is above this canal that goes into the ocean. I can see the ocean from here as well. After resting a little bit, we ventured to the Daiso! It is a 100 yen store ($1 USD). They have good quality things that range from beauty products to dog treats to household items. I am seriously going to miss having a store like this when I get back to Hawaii. We went to a clothing store, Uniquelo, and it’s the equivalent of Forever21 but much much better quality. They have weekend sales and Cathy & I got some really amazing deals. 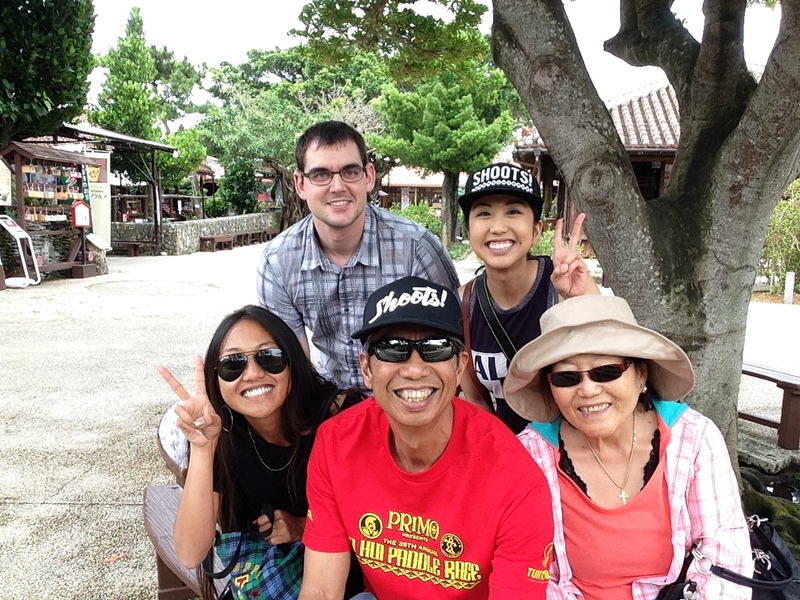 That was my first day in Okinawa and it was quite eventful. I need to brush up on my Japanese language skills (thanks Ms. Shiraki, my 8th grade Japanese language teacher!). Cathy buying cute souvenirs in a store named Splash! 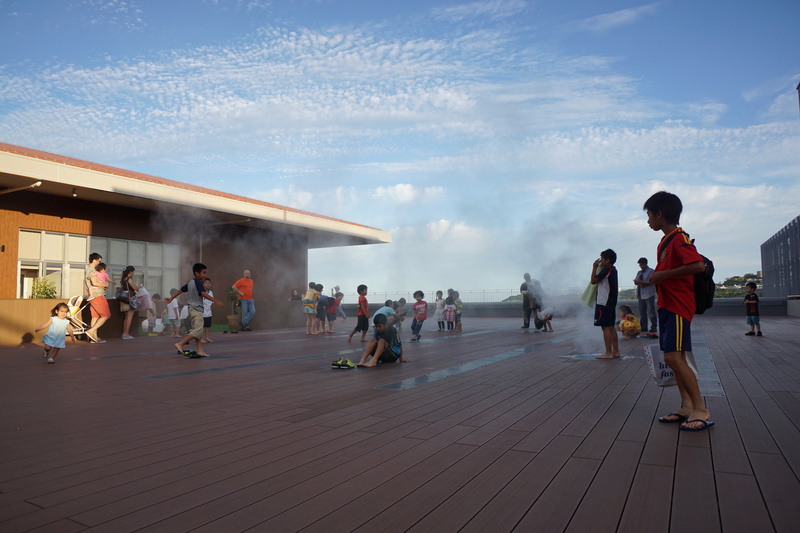 Really neat children play area on the roof where mist comes out of the ground. 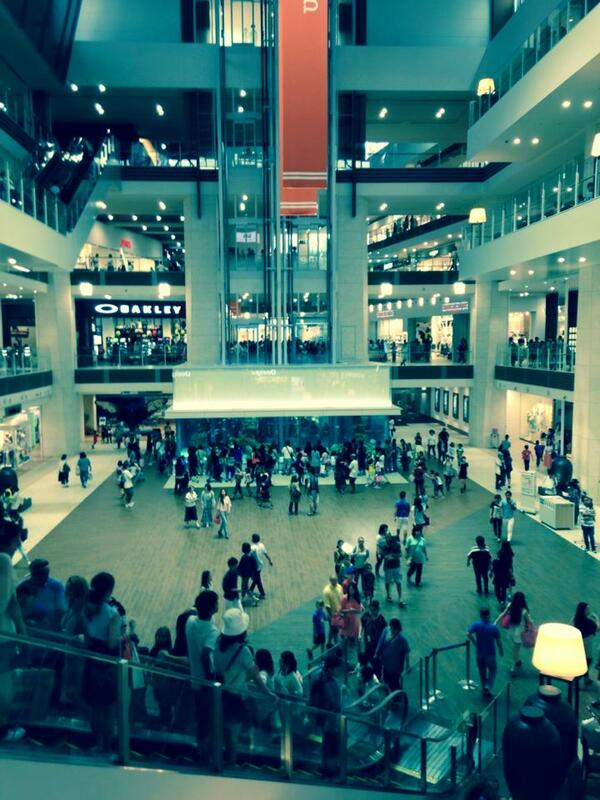 The mall from the 2nd floor. 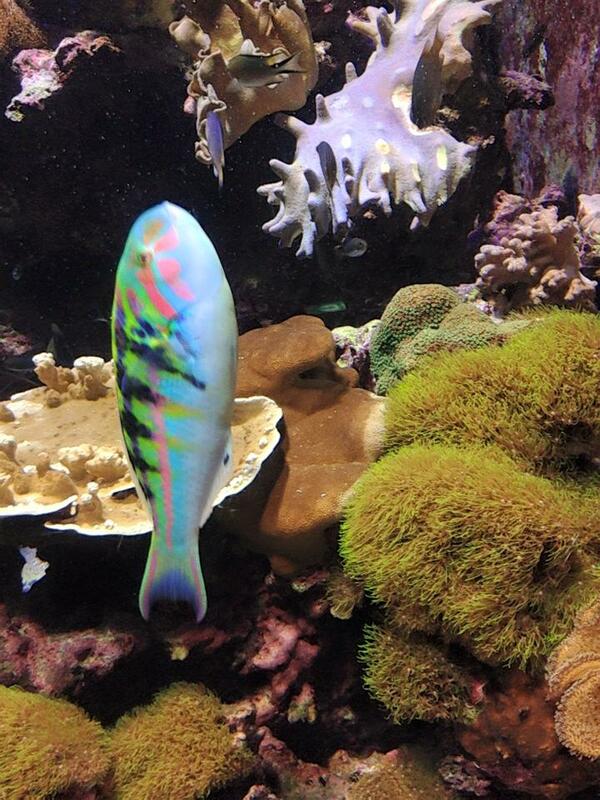 They have a pretty good size aquarium with sharks, eels, and a huge Wrasse! View from the top of Aecon Mall! There’s a Yakuza house at the top of that hill with gold-trim and super expensive cars in the garage. Bye guys! I miss and love you all! 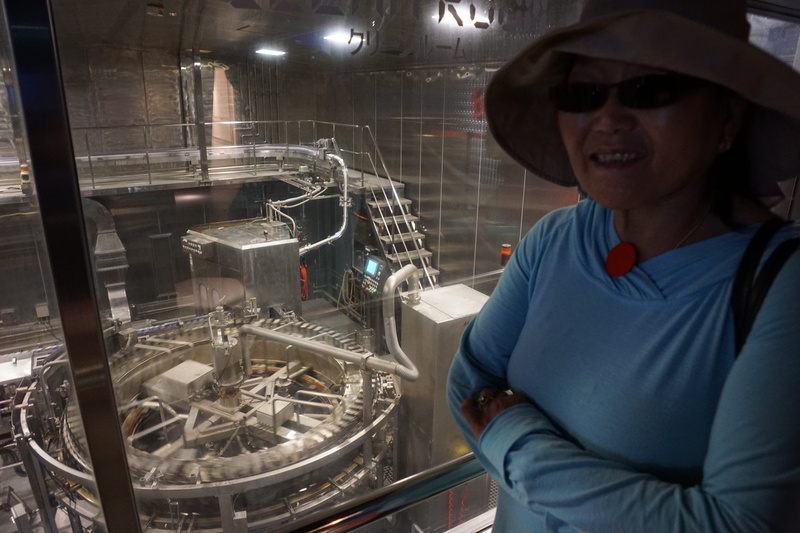 This entry was posted in 2015 and tagged AECON, kokusai, okinawa, travel. 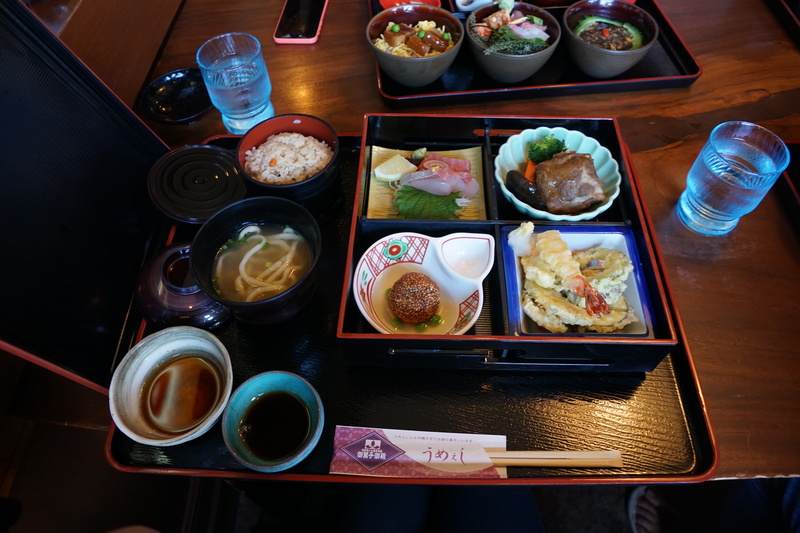 First Post: Layover in Tokyo traveling to Okinawa! I made a promise to myself that instead of the monotonous routine of posting on social media such as Instagram or Facebook, I would make an actual blog, and here it is! I wanted to deactivate my Facebook over the summer during my travels and keep an online journal instead. It’s been a hectic past couple of days of flying, catching trains, and finally arriving to my final destination, Uchinaa (Okinawa). 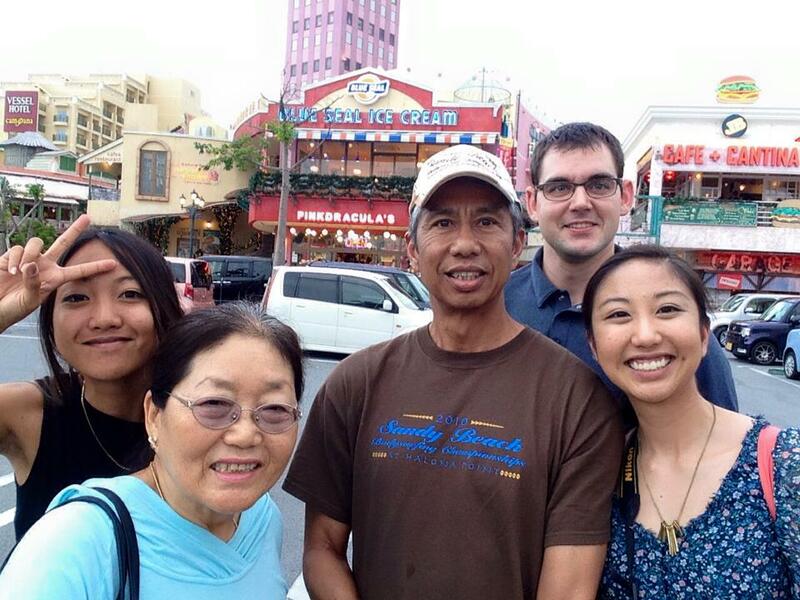 I am so happy to see my parents and sister/brother-inlaw because I haven’t seen them in over a year. I feel very close to my family and it was a struggle to not be near them for so long. It’s truly a blessing to also visit the land where I came into the world. 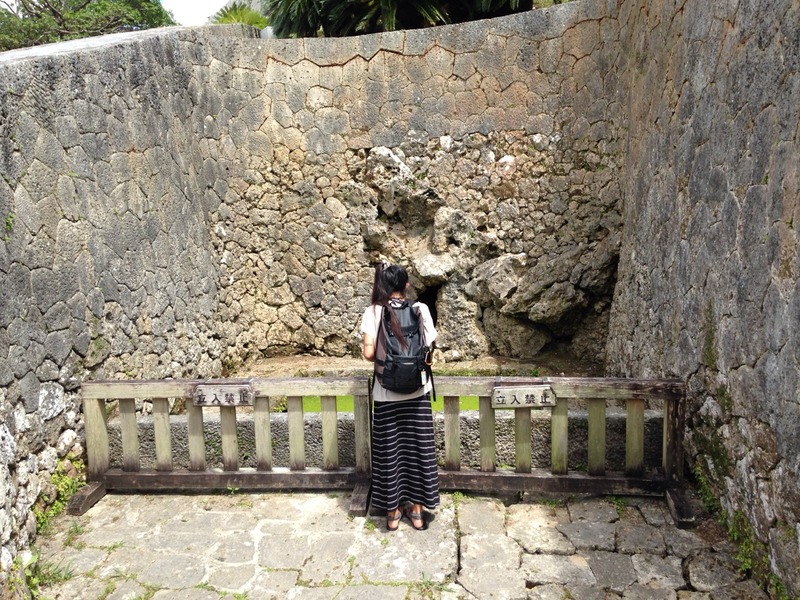 It has been a dream of mines since I was a young child growing up in Hawaii to visit my birthplace of Okinawa. Thank God that the universe lined up in my favor and I am so grateful to celebrate my milestone of graduating from the University of Hawaii at Manoa in a place where I had my first beginnings in life. 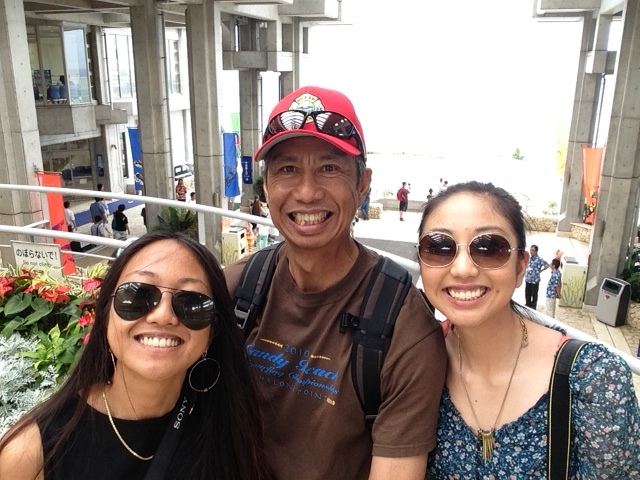 I caught my plane from Honolulu International Airport and sat next to a married couple from Palau. 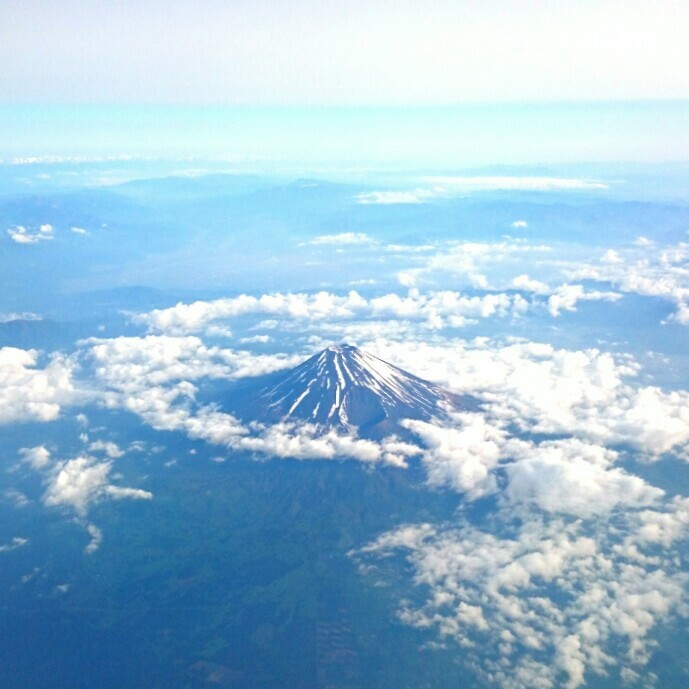 The flight was very long but I somehow was able to sleep. I arrived in Narita International Airport and caught the train into Tokyo where Satomi-san met me 🙂 Special thanks to Uncle Ted for letting Satomi know I was coming and for buying my museum tickets!!! 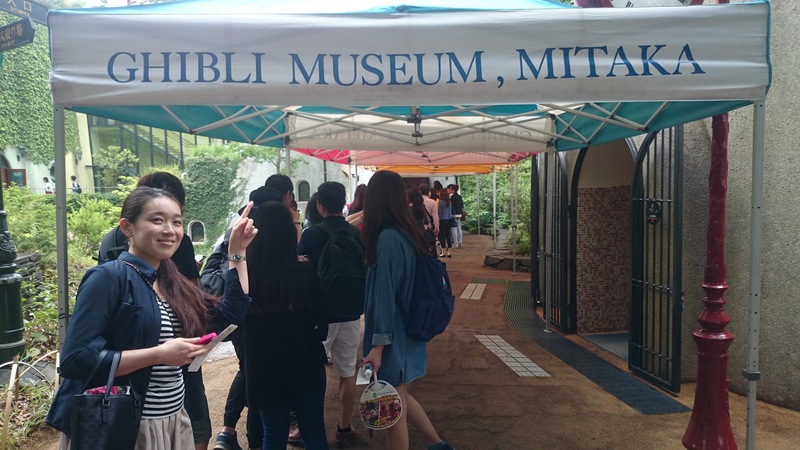 I had a 20-hr layover in Tokyo and I immediately planned a visit to another bucket-list place, The Ghibli Museum in Mitaka. I asked if Satomi could buy my ticket and also accompany me there and it worked out! 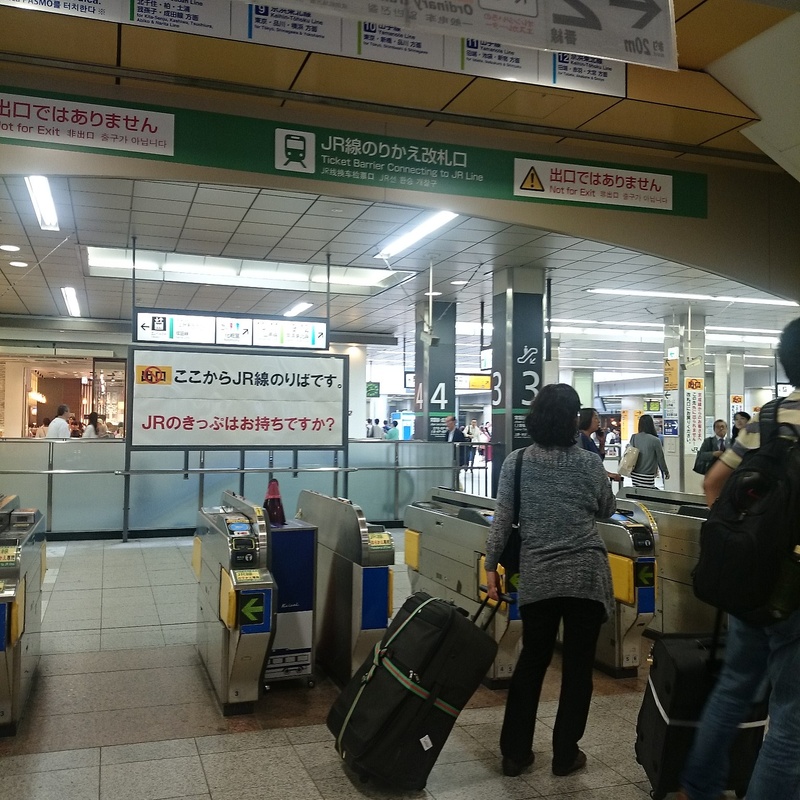 I have to admit, the Tokyo train system is absolutely amazing and I am thankful that I had Satomi to guide me because I would have been lost (she mentioned that people from outside Tokyo need help catching trains). 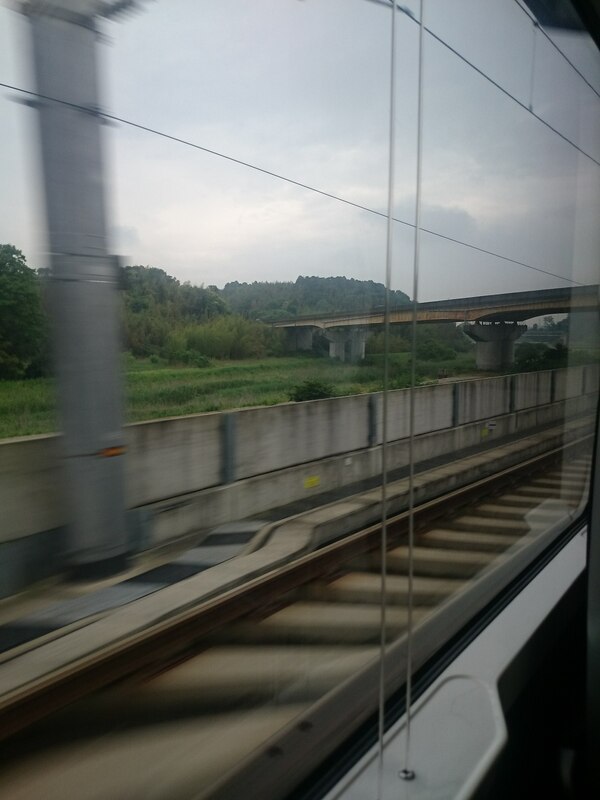 Narita International Airport to Nippori! My mom is calling me to go eat breakfast so I gotta go! I miss and love you all! 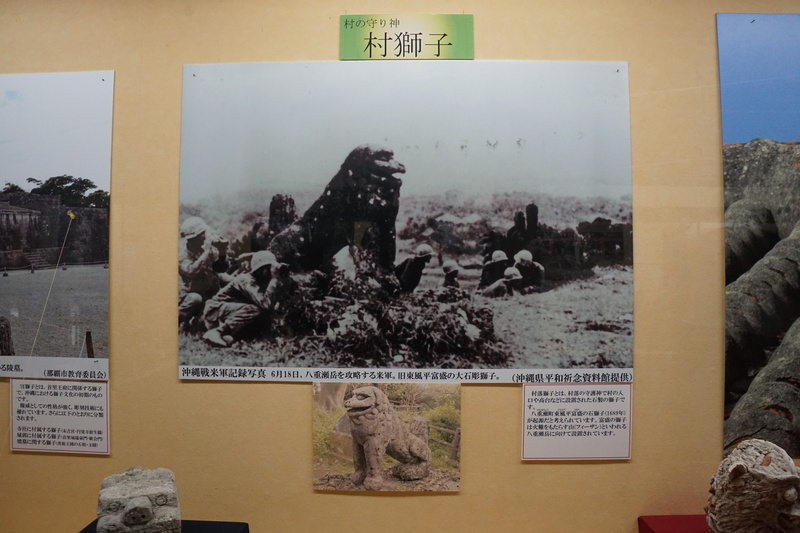 This entry was posted in 2015 and tagged fujisan, ghiblimuseum, layover, okinawa, tokyo, travel.